When I think of pressurized ballpoint pens, I tend to think of something small and durable, like the Fisher Cap-O-Matic Space Pen or the Tombow Airpress. These pens are meant to slip easily into a pocket or get banged around in a backpack, ready to write on a dirty slip of paper held up against an airplane window, if need be. Meanwhile, the Pilot Down Force is like the awkward cousin of the pressurized pen category. It’s bigger, clunkier, and it has a clip that juts out a little too far. Regardless, the Down Force writes just as well as these other pens. Its thick barrel and knurled, plastic grip make it a comfortable writer, and the pressurized ink works at any angle and on most surfaces. The Down Force also has a convenient spring-loaded clip, which ties in with a very unique retracting mechanism. 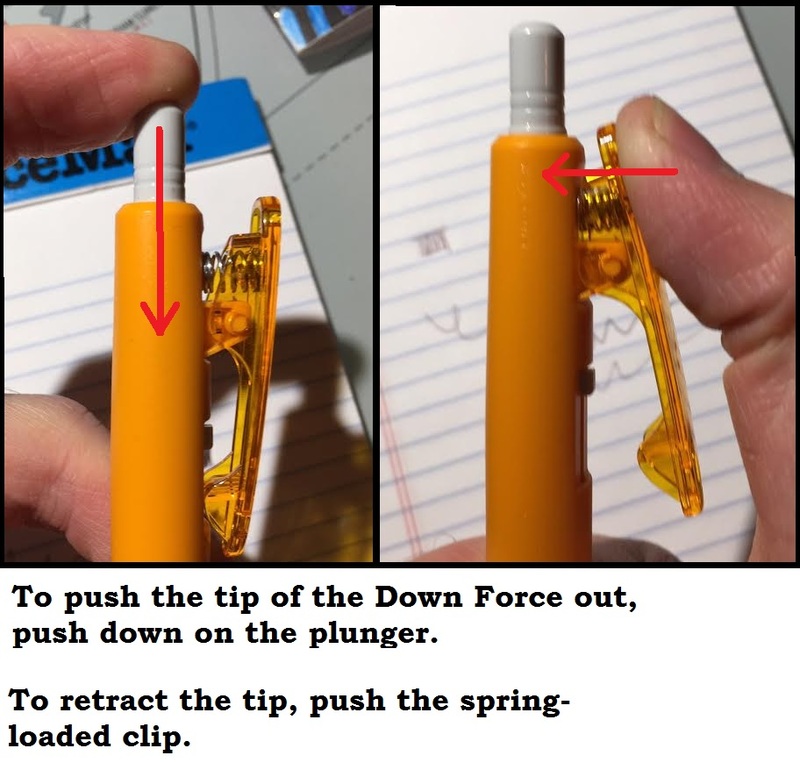 Like most retractable pens, pressing the plunger down will eject the pen’s tip, but it only retracts when opening the clip. It’s a feature that’s meant to prevent ink stains on shirts and pants, since it’s impossible to clip the pen to anything with its tip exposed. I like this feature – it reminds me of a low-cost version of the Lamy Dialog 2 – but it definitely takes a little getting used to. The Down Force is one of the less expensive pressurized ballpoints on the market, and it comes in an array of neat colors that add a fun personal flair – I went with the orange. In the end you get a good pen, just not one that’s as pocket-friendly or durable as others in its category. I like it, but I don’t think it will ever replace my space pen. Review from The Acculturated Housewife, who recommended the Down Force to me. She prefers it to the Tombow Airpress. Review at The Clicky Post. He loves the knurled grip, but hates the clip and its retracting mechanism. I agree that the clip juts out further than it needs to, but that retracting mechanism has really grown on me. A short review at he Unroyall Warrant, who loves the “click” and loves the fun colors… but that’s about it.